As promised during the election campaign, on Jan. 23, President Trump signed the executive order withdrawing the United States from the Trans-Pacific Partnership, a trade deal with 11 other countries. Renegotiation of the North American Free Trade Agreement is Mr. Trump’s next big step on trade policy. In his first week, his administration suggested that Mexican imports would potentially face a 20 percent tax in order to finance a wall on the U.S.-Mexico border. The president’s actions are rooted in his belief that U.S. free trade agreements have enlarged U.S. trade deficits, causing job losses and wage declines. A trade deficit happens when a country’s imports of goods and services exceed its exports of goods and services. In other words, when a country buys more from the rest of the world than it sells, the country incurs a trade deficit. In 2016, the U.S. trade deficit was about $500 billion. The trade-weighted exchange rate of the U.S. dollar. Putting these forces together, the United States incurs a trade deficit when it spends more than it earns — bearing in mind that national spending and earnings are influenced by the tempo of economic activity abroad and the foreign exchange value of the dollar. When economic activity abroad is robust, it’s easier for U.S. firms to sell goods and services to foreign buyers, but when the dollar is strong, U.S. firms find it harder to sell abroad and easier to buy foreign goods and services. Because the United States persistently spends more than it earns and because the dollar is historically strong thanks to its safe-haven virtues, the United States has incurred trade deficits for almost half a century. Since 2000, the annual trade deficit has averaged $535 billion. To finance the trade deficit, the United States must either borrow from foreign lenders or attract investment from abroad. In 2015, the United States earned $16.9 trillion by producing goods and services for domestic and foreign markets, but spent $17.4 trillion buying goods and services made at home as well as abroad. Thus, the U.S. trade deficit was $500 billion in 2015, and it was financed both by loans from abroad and foreign firms investing in the United States. How do trade agreements like NAFTA and the Korea-U.S. Free Trade Agreement fit into this story? Fundamentally, they reduce frictions that impede two-way trade, financial flows and investment between the partner countries, but they do not alter the broad macroeconomic forces just listed above. Free trade agreements might alter the size of the U.S. bilateral trade deficit with the partner country, but they make little difference to the overall size of the U.S. trade deficit with the world. If the U.S. trade deficit with Mexico, for example, grows, because NAFTA reduces border frictions between the United States and Mexico, the U.S. trade deficit with the rest of the world will shrink to the same extent. The table below summarizes U.S. two-way trade and the trade balance (deficit or surplus) with major trading partners in 2015. The United States runs bilateral trade deficits with China, Germany, Japan, Korea and Mexico, but it runs small trade surpluses with Canada and the United Kingdom. But this table provides a misleading guide for making trade policy, which should ideally seek to expand multilateral trade between all parties, not to redress bilateral imbalances. In previous work, Gary Hufbauer and Zhiyao (Lucy) Lu showed that free trade agreements have little or no impact on the size of the U.S. global trade deficit. While the trade deficit has become a punching bag in U.S. politics, in the realm of economics, the debate is not one-sided. When a country is growing rapidly or experiencing high inflation, economists generally believe that the benefits from a trade deficit outweigh its costs. But during a recession or when a country suffers deflation, a trade deficit probably does more harm than good. What are the economic costs of the trade deficit? Since the trade deficit is concentrated in manufactured goods, a larger deficit translates into fewer manufacturing jobs. 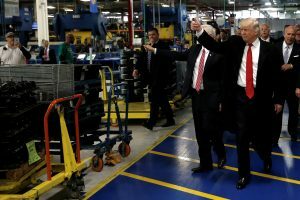 In 1970, 26.4 percent total U.S. non-farm employment was engaged in manufacturing; in 2016, the figure had dropped to 8.5 percent. Automation explains most of the decline, but if the United States had no trade deficit in 2016, manufacturing employees might have accounted for 10 percent of the labor force. Those who view manufacturing as superior to the service industry accordingly criticize the trade deficit. The longer large trade deficits persist, the greater the extent of foreign claims on the United States, either in the form of loans that must be refinanced or repaid or assets owned by foreigners (firms, buildings or land). In 2015, the total of foreign loans and assets held in the U.S. economy was $30.6 trillion; but this was balanced by U.S. claims, representing assets and loans abroad, totaling $23.3 trillion. If net foreign claims (now $7.3 trillion) become a very high fraction of U.S. GDP (currently about 40 percent), the burden of paying interest and dividends could become a significant drain on the U.S. economy. What are the economic benefits of the trade deficit? The trade deficit provides real resources for investment in U.S. productive assets, because it is financed by foreign direct investment, loans and bonds. Research shows that foreign firms operating in the United States pay above average wages, invest more in research and development and generate spillover effects that enhance the productivity of U.S. companies. The U.S. International Trade Administration reports that foreign firms directly employ 8.5 percent of the labor force, while indirect employment and productivity effects push the total to 12 million jobs. A trade deficit dampens inflationary pressures when the economy approaches full employment (less than 5 percent unemployment). Larger imports can supply goods and services to the domestic market that cool down prices. Finally, a U.S. trade deficit furnishes economic stimulus to the world economy, a feature that can be helpful when world growth is lethargic — the situation today. What policies can the United States follow to reduce the trade deficit? A realignment of exchange rates (meaning a cheaper dollar relative to the euro, the yuan, the yen and other currencies) can improve U.S. trade deficit. Rough estimates suggest that a 10 percent drop in the foreign exchange value of the dollar would diminish the trade deficit by about $220 billion annually. In principle, the Federal Reserve and the Treasury could coordinate their policies to decrease the trade-weighted value of the dollar. Border tax adjustments at a 20 percent rate — as proposed by House Speaker Paul Ryan and Ways and Means Committee Chairman Kevin Brady — might have some of the same effect as a decrease in the foreign exchange value of the dollar. Additionally, so long as the United States runs a trade deficit, border tax adjustments would generate a positive revenue flow to the U.S. Treasury, possibly $1 trillion over 10 years, which in turn could reduce the government deficit. On a smaller scale, if supported by the Trump administration, the U.S. Export-Import Bank can provide financial support for U.S. exports. Economist Caroline Freund reports that the near-cessation of Export-Import Bank lending over the past year has hurt U.S. sales abroad — not a good outcome. Withdrawal from Trans Pacific Partnership, renegotiation of the North American Free Trade Agreement and launching trade actions against China ensure political headlines, but they will not make much difference to the global U.S. trade deficit. However, President Trump’s economic agenda centers on tax cuts, infrastructure and defense, implying a larger budget deficit and considerable fiscal stimulus. This may be just what the lackluster U.S. economy needs, but it’s not a prescription for smaller trade deficits. Moreover, to forestall a spike of inflation, the Federal Reserve might accelerate the rise of interest rates, pushing the dollar higher. A stronger dollar and stronger domestic demand will almost certainly enlarge the trade deficit. Withdrawal from Trans-Pacific Partnership, renegotiation of the North American Free Trade Agreement and launching trade actions against China ensure political headlines, but they will not make much difference to the global U.S. trade deficit. Nor will they bring more jobs and higher wages to U.S. workers. Gary Clyde Hufbauer has been the Reginald Jones Senior Fellow at the Peterson Institute for International Economics since 1992. Hufbauer has written extensively on international trade, investment, sanctions and tax issues. 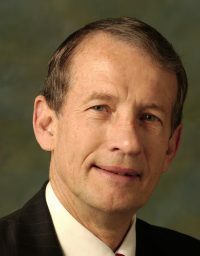 His coauthored titles include "Bridging the Pacific: Toward Free Trade and Investment between China and the United States," "Economic Normalization with Cuba: A Roadmap for US Policymakers," "Outward Foreign Direct Investment and US Exports, Jobs," and "NAFTA Revisited: Achievements and Challenges." 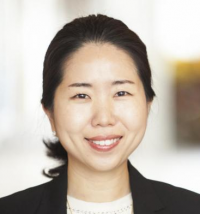 Euijin Jung is a research analyst at the Peterson Institute for International Economics.